The prosperous, leafy commune of Auderghem lies to the south-east of the city beyond the communes of Etterbeek and Ixelles. It is rich in green spaces, boasting verdant parks and gardens and stretching into the Forêt de Soignes at its southerly end. The area is characterised by large period houses and elegant modern neighbourhoods which attract EU workers looking for family homes. Visiting heads of state sometimes stay at the old Val-Duchesse priory, a vast converted Dominican abbey that extends along the Boulevard de Souverain. Auderghem’s cultural centre presents a rich programme of international theatre, and art exhibitions can be seen at the Rouge-Cloître, an old Augustinian monastery. 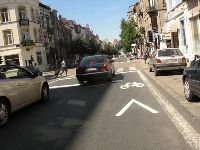 Auderghem has a large shopping centre near the Hermann-Debroux flyover, and local stores flourish along the Chaussée de Wavre and at Place Pinoy. The commune is also home to the Japanese School of Brussels and the alternative school L’Autre Ecole, as well as a well-respected music academy. Large traffic arteries ensure the commune’s accessibility by car. In addition, Auderghem is well connected to the local transport network by bus, tram and metro.